So recently it’s been (pardonne-moi) freaking HOT!! I can’t even explain it well except for saying that the water from the shower feels like it was mixed with boiled hot water, you’ld either need an air conditioning system in the bathroom or put half a bucket of water in the fridge half an hour before you shower( that is if you don’t wanna be sweating right after you turn of the shower)!! Anyways this got me drinking lots and lots of water that you could literally hear the water rumble when I shake my belly *giggles*….This brings me to what I’ll like to write about – WATER(AQUA)…. Have you ever wondered why it takes not watering a plant for it to dry and wither away? Is water really that important? I hope after reading this you’ll ditch all them sodas/soft drinks and gulp as much water as you can everyday….Let’s look at some important tricks water can do to our Hair…..
Water cleanses the hair and helps for easy detangling of hair strands. Lately, I started using only water to detangle and unravel my twists and the results have been amazing; If you style your hair while it’s wet, you get a different shape as the hydrogen bonds which the strands are made up of will reform, water is the most natural setting lotion for your hair. Did you know that if you drink two liters of water every day you’ll get gleaming and healthy tresses because Water makes almost ¼ of the weight of a hair strand? (Required intake is at the least eight 8-ounce glasses of water or 2 liters or half a gallon daily). 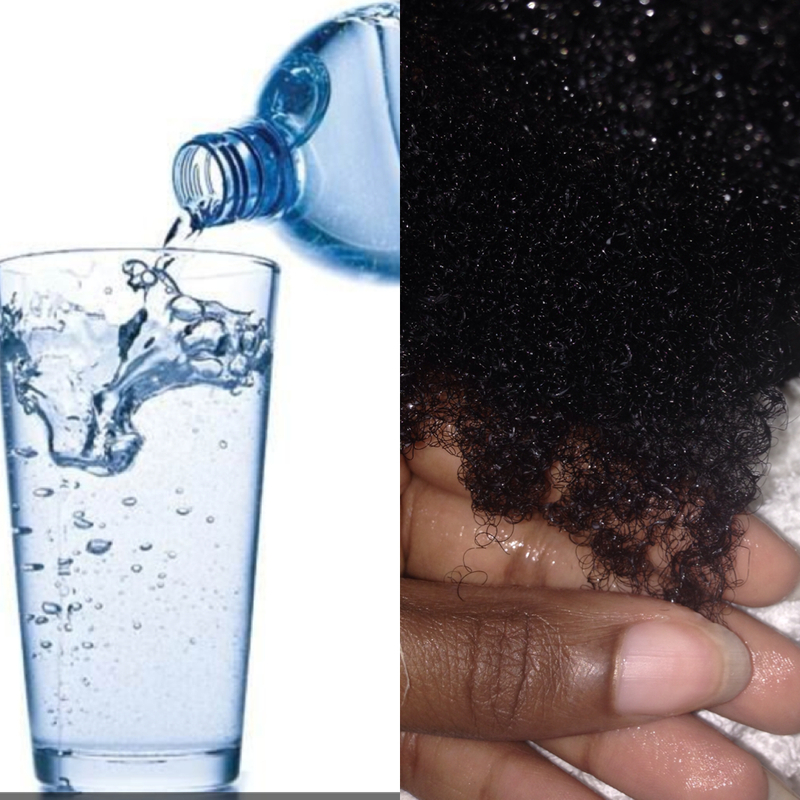 Water as a natural ingredient supports vitamin consumption and assists in efficient and healthy hair growth. Water flushes out toxins from the body and helps cells rejuvenate when you drink it. Water acts as a perfect remedy to protect your hair from getting damaged. Doing a cold water rinse after you shampoo your hair will close the cuticles, preventing any damage to the hair shaft; while Hot water rinses and steam open up clogged pores.Also wetting your hair with normal water before swimming in chlorinated water prevents it from chlorine’s ill-effects to a large extent. Our hair gets thirsty just the same way our body does and it needs water to quench that thirst. Lack of moisture results in dry and brittle hair and lack of adequate consumption of water may reduce or stop maximum genetic rate of hair growth and may lead to dehydration which has an impact on the growth of hair directly. The roots of the hair are the means through which water is transported from the body;the roots soak up water and provide hydration to the rest of the hair strand. If you’re not used to drinking water or not the water type, you should put in a deliberate effort to make sure you make it a habit, just so you know the body is about 60% water, believe it or nah. Water is your hair’s best moisturizer!! 1Tbsp Hair butter in a spray bottle,shake well then divide hair into different parts and spray from root to tip. Look out for ingredients in any moisturizer you want to purchase, if it doesn’t contain Water(Aqua) then it would not moisturize!!! Thank you for clicking and reading this Post, I hope you drink as much water as required…. This is me taking over from Jazz…. Next Next post: Nuts About Hair!! !